As I understand it, there are two mechanisms for throwing somebody out of the UK: deportation and removal. Informally, people seem to call both of these "deportation". What are the differences between them? Who do they apply to? Do they have different effects on the person's ability to return to the UK later? People will often mistakenly use 'deportation' instead of 'removal'. The media reinforces this mistake because 'deportation' sounds more dramatic than 'removal'. Both terms involve the involuntary departure of a person from the UK's jurisdiction. Deportation in the UK is a grave event, there have only been a handful this year. The profile of a deportee generally looks like this: the person was remanded in custody for a criminal offence; they were convicted in a court and sentenced to a prison term exceeding one year. After serving their sentence but before their release, the Home Office asked the Crown Prosecution Service for a deportation hearing. At the hearing, the judge decided whether or not to hand down a deportation order. EEA nationals can be deported following a criminal offence and this constitutes most deportations. Removal, on the other hand, happens all the time. 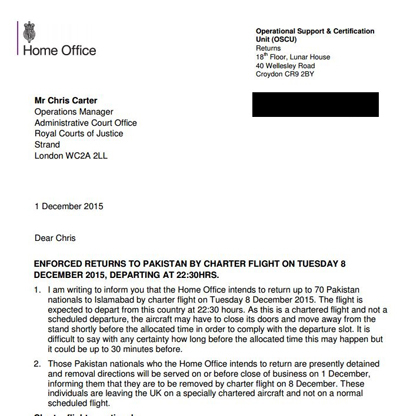 Almost every week a charter flight leaves for Pakistan (among other places) with 40 - 50 passengers who have been served removal papers. There are two different kinds of removals: an inland removal and a removal from port. The profile of an inland removal case usually looks like this: the person was caught violating the terms of their visa (or caught as an illegal entrant). The person was detained until the authorities decided if they would exercise discretion in the person's favour or not. If the decision was adverse, the person was escorted to an exit port (e.g., Gatwick) and put on a flight home. The profile for a removal from port looks like this: the person arrived at a port of entry and failed their landing interview. As a result they got 'turned around', 'bounced', 'refused', 'denied entry', or to be precise: 'removed'. When a person is removed from port, the authorities do not need to send the person to their home country, they can pick any country where the person is admissible. Part of the removal process involves taking the person's biometrics. This is voluntary, but if the person refuses, they get a 10 year ban under Paragraph 320 (8A). The first of these three categories, deportations, is a specific term that applies to people and their children whose removal from the country is deemed 'conducive to the public good' by the Secretary of State. Deportation can also be recommended by a court in connection with a conviction of a criminal offence that carries a prison term. The second category, administrative removals (or just 'removals'), refers to a larger set of cases involving the enforced removal of non-citizens who have either entered the country illegally or deceptively, stayed in the country longer than their visa permitted, or otherwise violated the conditions of their leave to remain in the UK. Some of these administrative removals are individuals 'refused entry at port and subsequently removed'. People in this category have been refused legal permission to enter upon arrival and removed, often after a single overnight stay (UKBA 2010). In a way, those removed in this manner have never actually entered the country: although physically present on UK territory, they have neither passed through border controls legally nor evaded them illegally. So, they may be excluded from totals, such as in Figure 1 below. However, this category of removals is included in Home Office reports on 'removals and departures'. Therefore it is included in some of the figures in this briefing, as specified. Both events have a long-term pejorative effect on the person. Both must be declared when the person applies for entry clearance and both make the person an illegal entrant if they enter the UK through the Common Travel Area. In the case of deportation, the person must apply to the court to lift the deportation order. Once the order is lifted, visa-nationals can go ahead and apply for entry clearance. Non-visa-nationals can arrive at a port and seek 'leave to enter' without first obtaining entry clearance. In other words their status returns to where it was before the deportation order was handed down. This procedure includes EEA nationals who have been deported. Also, the lifting of a deportation order is no guarantee that the person will not be removed if they attempt to enter the UK. For removals where a ban has not been imposed, the person does not need to apply to the courts because there's nothing to lift; visa-nationals must apply for entry clearance and non-visa-nationals can seek 'leave-to-enter' at a port. There is no requirement for a non-visa-national to obtain entry clearance, but lawyers generally insist upon it for their clients. From a practical viewpoint the only difference between the two is getting the deportation order lifted. Summary: As I mentioned, people will use the terms interchangeably and it's generally harmless. But problems can arise when people research 'deportation' for something that is actually a 'removal'. Note: There is no way to expunge a removal or deportation from someone's record. Even if a non-visa-national clears immigration controls, the event is still on the person's transcript. A note on terminology: The UK Government never 'denies' someone, it's not in the corpus. They 'refuse'. Note: The only sure way to determine if it is 'safe' to enter the UK following a deportation or removal is for the person to get an entry clearance. Adding... In most cases the terminology is generally expandable to Schengen. Not the answer you're looking for? Browse other questions tagged uk legal terminology removal deportation or ask your own question. Can an American get a UK Transit Visa on Arrival?